"It was very sudden. I was planning to start a sextet and I heard that Art was leaving Gerry Mulligan. I planned to ask him to join the sextet. In the meantime, unknown to me, he was planning a quintet and he was thinking of asking me to join him. When I called him, he started laughing. So we got together and consolidated our plans." During its three years of existence (1959-62), The Jazztet--along with Art Blakey's Jazz Messengers and Horace Silver's quintet--was the definitive hard bop combo. 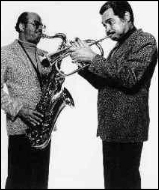 Benny Golson's compositions and arrangements gave the sexted a personal sound and a consistenly fresh repertoire, the rhythm section (despite many changes in personnel) always swung steadily and the soloists were distinctive and inventive. Why then did commercial success completely elude this band? It was perhaps a forecast of things to come when the jazztet was booked for its New York debut on Nov. 17, 1959 at the Five Spot, opposite Ornette Coleman's innovative quartet. Ornette received the headlines, controversy and fame, while the Jazztet's relatively conventional music was given faint praise and taken for granted, a victim of the "new is automatically better than old" school of jazz criticism. Each of the Jazztet's three horn players already had impressive musical resumes at the time of the ban's formation and were quite familiar with each other's playing. Art Farmer's soft attractive sound and fluent yet lyrical trumpet style made him in much demand for record dates, including separate sessions led by Curtis Fuller and Benny Golson in 1957. Just prior to the official formation of the Jazztet, Golson and Fuller co-led a quintet that lacked only Art Farmer. Shortly after Meet The Jazztet, the group was reorganized with only Farmer and Golson remaining among the original members. The musical quality (with such substitutes as pianist Cedar Walton and trombonist Grachan Moncur III) remained quite high until they called it quits in 1962. Happily, Art Farmer, Benny Golson and Curtis Fuller stayed at the top of their form through the years and, starting in 1982, have occasionally reunited as the Jazztet. McCoy Tyner, of course, became an influential giant, while Lex Humphries has remained active, although maintaining a low profile. Unfortunately, Addison Farmer passed away in 1963 from a congenital brain hemhorrage. 30 years later, the Jazztet's music is still fresh and undated, although no longer taken for granted. Meet The Jazztet is their definitive recording. A selected discography of albums by The Jazztet. Meet The Jazztet, 1960, Argo/Chess. Big City Sounds, 1960, Argo/Chess. And John Lewis, 1960-61, Argo/Chess. At The Birdhouse, 1961, Argo/Chess. Here And Now, 1962, Mercury. Another Git Together, 1962, Mercury. Back To The City, 1986, Contemporary.